Relative to most sectors, school districts are a lot more generous about paying full freight. Almost 50% of districts for which we have health benefits data pay up to 100% of health insurance premiums for individuals. The clear majority, 70%, pay up to 90% or more of the premium. On average, these 57 districts pay up to 93% of individuals' premiums. By contrast, in 2012, the average employer contribution across all industries was 82%, according to the Kaiser Family Foundation's Annual Health Survey. Being a member of the union confers additional benefits on teachers in some districts. For example, in Jefferson Parish, Louisiana, where being a member of the union is not obligatory, health insurance premiums are lower for union members. Union members in Columbus, Ohio, have additional health insurance options beyond what the district provides all teachers. Districts are not providing coverage for dependents nearly as much as they used to. Only one in five districts for which we have data (n=55) pay up to 100% of health insurance premiums for dependents. Three districts don't contribute anything towards dependents' premiums. 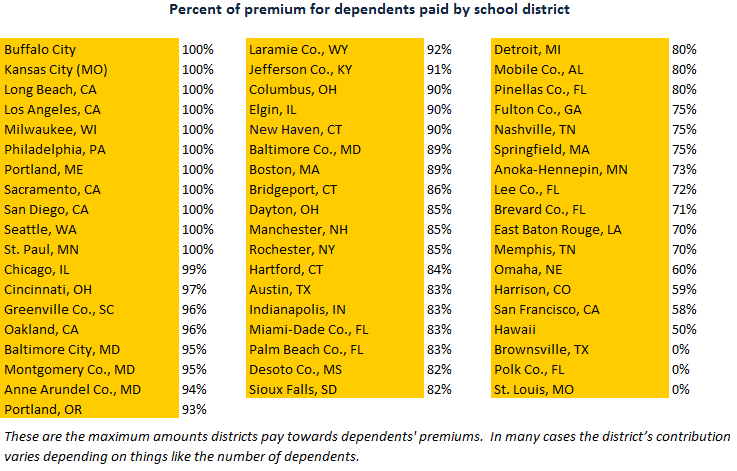 Together, these districts' average contribution to dependents' premiums is 81%. That's not much different than the average across all industries in 2012, which was 72%, according to the Kaiser Family Foundation's Annual Health Survey. Though we've listed premium contributions as percentages, we've come across a number of districts that put monetary caps on total health insurance contributions. In effect, that means districts can be assured that they will spend only a certain amount on healthcare, regardless of increases in premiums or the number of dependents needing coverage. San Francisco will pay up to $733 per month for the combined premiums of individuals and dependents. In Tulsa the cap is $450, and in Little Rock it's $283 per month. Jefferson County, Colorado and Denver give the same monthly payment to all teachers to go towards medical, dental, and vision coverage, regardless of the number of dependents. In Jefferson County the monthly allocation is $515; in Denver, it's $415.